This entry was posted in daily links and tagged Apple, doctors, flipkart, forbes, heealth, opportunity cost, retail, seth godin, woes on June 25, 2012 by mayank. This entry was posted in daily links and tagged class, forbes, founders, health, healthcare, Investment, notes, peter thiel, seth godin, startups, valley, vc on June 24, 2012 by mayank. This is a classic dilemma that many entrepreneurs(especially the offline one’s) are likely to run into. Customers as we all know come in all shapes and sizes(and mindsets). While there will be some customers who will talk nicely to you and your employees, pay their bills on time and offer you a piece of advice or feedback whenever needed, there’s also a bunch of customers that’ll act as if they are doing you a big favor by using your product or services, they’ll negotiate endlessly on the price and keep getting into endless debates about the most minute(and irrelevant) issues possible. As an entrepreneur and consultant both I too have run into the thought of segmenting customers into good,bad and ugly but I am not completely convinced if that’s such a good idea. I mean on one hand there’s a thought of optimizing the whole thing for a better ROI on other hand there’s this idealistic thought that customers/clients should be treated fairly and equally irrespective of their spending powers and other behaviors. I for sure would like to get a fair/equal treatment in all the products and services that I use irrespective of the segment I belong to. If you’re going to be obsessed with delighting customers, it’s a lot more efficient to focus on customers that are able to be delighted. A case in point being if a particular bunch of customers is impossible or way too difficult to delight/please why waste your resources on them when you could focus ’em on some other set of customers that are more likely to be delighted by what you are offering? Is the customer bad or your offering? A situation like this can also be a opportunity to give your offering another in-depth look. Maybe the customer is right and there’s indeed a scope for offering a better solution at the same or reduced price or maybe the customer service offered isn’t up to the mark. So before branding a customer as a bad apple, give a second thought to their feedback and see if there’s a genuine problem there. How would it affect the Word of Mouth? What do you think about treating different customers differently? This entry was posted in business, customer service, organisations, start-up, Strategy and tagged business, customer service, customers, entrepreneurs, seth godin on March 20, 2010 by mayank. About 8 months ago I complied a presentation containing best tweets from Social Gaming Summit 2009 which got a good response and appreciation so I thought of doing the same for #smallbizsummit. This entry was posted in conference, events, microcontent, presentation, start-up, The Remarkables and tagged business, entrepreneurs, nyc, seth godin, smallbizsummit, smallbusiness, summit on March 18, 2010 by mayank. Yesterday evening while trying to explain some best practices for writing emails to my younger brother I tried to make my point clear by showing him some examples and asking him to identify the differences. Given the amount of badly designed/structured emails doing rounds it wasn’t hard to find an example of badly designed email from my inbox. Here are two emails that I picked up for him, both are regarding bloggers meet. Though I wasn’t expecting him to flag the first one as spam but I guess that’s how it would appear to anyone who doesn’t know the context beforehand. 1) ‘To’ Field: I try to find some clues like who all was the mail addressed to etc, from the ‘To’ field (some people put their entire list in to field btw). As you can see here the email’s ‘from and to’ fields are same. Thankfully email clients don’t work like packet sniffers else this mail would have reach spam folder directly, no questions asked. Perhaps like we used to think during our college day the sender thought it’s mandatory to have an address in ‘To’ field and therefor it’s their name in the ‘To’ field while the addresses email id’s are shoved in the ‘BCC’ field. 2) ‘Greeting’: It’s basic courtesy (common sense?) to greet someone by their name (unless you are not sure about their name) when sending email and it’s even more important when you are sending mail to a blogger on behalf of a client. The last thing the recipient should think is if it’s a bulk email or worse spam. Given the fact that recepients of such emails wouldn’t be numerous I don’t think it would have bee a tough job. 1) Don’t send bulk emails. And if you have to then don’t make it apparent that it’s a bulk email by addressing it like ‘Hi Bloggers’ or ‘Hi Guys’ . Though the ‘To’ field here has your name unlike in example 1 above since it starts with just ‘Hi’, you can’t assume that this email is just being sent to you. ‘Your blog makes for very interesting reading’. That’s the kind of lines spammers use these days. Avoid them and insted writing something that seems more genuine and believable. Now that’s seriously lame. Thankfully they didn’t add neighbours and relatives to the list. 5) Have an opt-out link: If for whatever reason you plan to send emails to people regularly without asking them before hand at least have a link for them to opt-out from your emailing list. You might want to checkout this awesome email checklist by Seth Godin and writing more effective emails by Chris Brogan for more on better/effective emails. Got some tips to share about writing better emails? 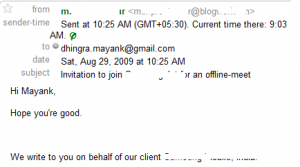 This entry was posted in bloggersmeet, misc and tagged better, bloggers, bulk, effective, email, mailer, mails, personal, relevant, seth godin, spam, targeted on September 11, 2009 by mayank.